Published: July 29, 2016 at 11:20 a.m. Updated: July 29, 2016 at 12:50 p.m.
Much of the hype heading into each season surrounds stars from the Football Bowl Subdivision's Power 5 conferences: ACC, Big 12, Big Ten, Pac-12 and SEC. Throw Notre Dame into that mix, as well. But last year, Football Championship Subdivision (FCS) power North Dakota State had the No. 2 overall draft pick in QB Carson Wentz. In fact, four first-rounders were picked from schools outside the Power 5 (plus, Notre Dame) last April while nine others landed in the top 100. As part of CFB 24/7's "16 for 16" series, I reviewed the top 16 players from outside the Power 5. Three stars from the FCS are included here, while the rest hail from the other FBS conferences. Levin's thick build and ability to move in space give him a chance to start at left or right tackle at the next level. Unlike many tackles coming out of the FCS level, this Moc has the strength to contribute right away. 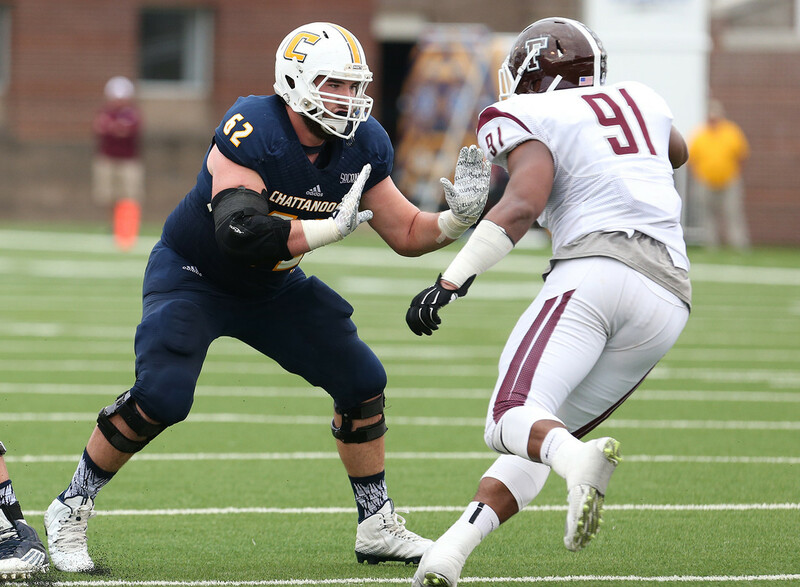 Chattanooga will again have an outstanding rushing attack (242 yards a game in 2015) with Levin leading the way. A very intriguing edge rusher prospect (15.5 tackles for loss, eight sacks in 2015), Rivers combines strength and length with a relentless nature. He might not get drafted in the first couple of rounds given the level of competition against which he plays, but I won't be surprised if Rivers makes an impression in the postseason all-star game circuit. The former LSU commit and JUCO star earned great praise playing for the Blue Raiders last season. His length (6-foot-2) gives him a chance at knocking down any pass thrown in his general direction (13 breakups in 2015). Teams looking for a massive two-gapper in the middle will like what they find in Singleton. He isn't going to provide a ton of pressure on the quarterback, but he has a nice get-off, which will challenge guards and centers trying to prevent interior collapsing of the pocket. Some NFL teams will consider him too small to be a starter in their schemes, but others will leap at the chance to get his quickness on the field on defense and special teams. He showed off great explosiveness both rushing the passer and tracking down runners while compiling 18.5 tackles for loss last season. Wilson is more stout than his former corner-mate --- Cincinnati Bengals first-round pick William Jackson III -- and proved an excellent playmaker in all three facets of the game in 2015. He was the only player in the country to score multiple touchdowns on offense (two rushing scores), defense (interception, fumble return) and special teams (two kickoff returns). Wilson moved from corner to running back when the team needed him late in the year, displaying the athleticism every NFL team desires. Do yourself a favor, don't get in Hill's way when he has the ball in his hands. The rising junior is a 6-foot-1, 219-pound beast between the tackles, coming off a 2015 season in which he finished eighth in the country with 135.9 rushing yards per game. He's not just a power back, though, as his footwork and vision allow him to sidestep defenders and find holes on the fly. Running back Donnel Pumphrey's success as a runner is in no small part due to Siragusa's power up front. Nico -- who is not the son of former NFL defensive lineman Tony Siragusa -- will make his own name on Sundays as a road-grader with relatively nimble feet for his size. Usually a small-but-versatile offensive performer gets selected in the third or fourth rounds (see Houston Texans 2016 fourth-rounder Tyler Ervin from San Jose State). Pumphrey is this year's candidate. The 5-9, 180-pound performer carried the ball 585 times over the past two seasons for 3,636 yards and 37 touchdowns. That's a lot of action for a back his size, but his elusiveness and straight-line speed prevent him from taking huge shots consistently. He also had more than 400 receiving yards last fall, and that might be a role he fills in the NFL. McGuire doesn't get much notice for his efforts outside central Louisiana. His game is no fluke, though, as he presents foot quickness, vision and forward lean to take advantage of creases in the red zone (35 career rushing touchdowns). His natural hands make him a legitimate receiving threat out of the backfield, as well (100 career catches for 1,145 yards and eight scores). This two-time first-team All-American Athletic Conference selection has great open-field moves and the straight-line speed to take away angles down the sideline. The junior produced back-to-back 1,000-yard seasons in his first two years with the Bulls, and is a threat in the passing game, as well. Look for USF to ride him for 200-plus carries yet again in 2016. Kupp will likely end up as the most productive receiver in FCS history; he already has 311 catches for 4,764 yards and a mind-boggling 56 scores in his career. But how Kupp tests athletically after the season will determine his final draft grade. Although Woods isn't the largest safety in the class (5-11, 219), his tenacious hits and playmaking ability won't be ignored by NFL scouts. The two-time first-team All-Conference USA selection has nine career interceptions and struck for 7.5 tackles for loss in 2016. Davis is among the most productive receivers in college football, using strong hands and surprising agility to rack up more than 2,800 yards and 27 touchdowns over the past two seasons. He'll likely be an early-round draft pick like former WMU wideout Greg Jennings, who was selected in the second round by the Green Bay Packers in 2006. It was a bit of a surprise when Kazee stayed in school for 2016. But he'll make his name known throughout the college football world this year with his combination of cover skills and open-field tackling prowess. The 2015 USA Today second-team All-American picked off eight passes last season and led the team with 58 solo tackles. This guy is magic with the ball in his hands, and makes plenty of plays with his arm when linebackers are waiting for him to take off. He'll put up excellent numbers again as the Cougars' team leader. Ward will likely attempt to play receiver in the NFL, a position he played early in his career with the Cougars (15-139, TD in 2014 before moving to QB). Though his slight frame (5-11, 185) might limit his draft stock a bit, successfully displaying strong hands in postseason workouts to go along with his elite elusiveness and straight-line speed could secure Ward an early draft slot.